It is waaay more complex than that, there is evidence that ants don’t follow the same governmental model of the ‘monarchy’ but instead it is the workers in charge, they bully the queen move her from place to place and if she stops laying eggs they will (in some cases) kill her. 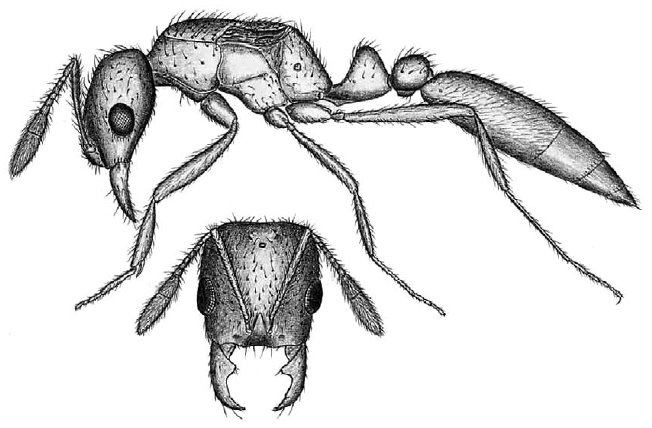 Some ants (like trapjaws) are even more intricate because any ant can become dominant and lay eggs. Also, ants have such complicated communication methods simple things like an “off” appearance don’t trigger a behavioral response, although in those frames you can see one or two workers figure it out when she attacks the existing queen, but her mandibles allow her to kill those ants with ease. Back on topic, ants also can be “suckered” into a lot of weird stuff via social parasitism. Regrettably I don’t have a “real” picture because there is only a single known specimen, but Solenopsis phoretica (a member of the elusive thief ant genus) grabs onto the petiole of other queens, then lays eggs by wrapping herself around the queens abdomen, workers treat the eggs of both queens as if they came from a single queen. This queen is incredibly small, and very little is known about it. On the other hand, ants are the only ones to crack the social code of ants, beetles, mites and many other creatures are able to hop into a colony and gain protection and food, sometimes even eating ant brood. I had no idea about that, just found it funny. I’m sorry if I came off as though I was blaming you for sharing it: I’m not. I’m sure you didn’t know, and that’s OK.
That game just triggers me so I gave a triggered response, but it was not directed at you, it was directed at the game and its developers. Someone has a special talent. I know this is old. But this just makes me smile and want to dance! I know this is old. But this just makes me panic and want to stay in bed, SAFELY. When I was just about to go to bed this was recommended to me by youtube, it’s pretty cool and kinda funny. I don’t often get to use Victor Borge sketches, but it seems appropriate here. @kylehayman361 needs to calm down. Always love me some quality ProZD shitposts. I present to you two videos in the same vein that always gives me quite the giggle. I love both of these videos so much OMG thanks so much for reminding me they exist. I nearly choked with my breakfast watching the first one. I already have a gravestone with “fuq da po lease” on it.